Solivita is a sprawling resort-style 55+ community with an impressive collection of world-class amenities. With Mediterranean-themed architecture, lush palms and a prime Kissimmee location, Solivita provides a bit of paradise to active adults aged 55 or better. The award-winning community features more than 150,000 square feet of recreational amenities, two 18-hole championship golf courses, scenic lakes and nature preserves. Homes are available in diverse sizes and styles, including 16 recently released floor plans. 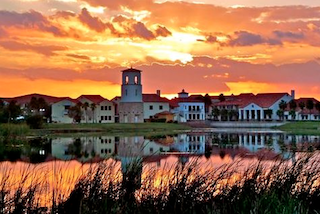 Although Solivita is designed with the picturesque charm of a Mediterranean village, its prime Central Florida location puts residents within easy reach of many popular attractions. The community is about 20 miles south of Orlando, 70 miles from the Atlantic Ocean and 90 miles from the Gulf Coast. Nearby retail centers, hospitals and other services also keep daily conveniences close to home. The Solivita community opened in 2000 and is being developed today under AV Homes’ Vitalia active adult community brand, with plans for nearly 6,000 homes. The community has recently been honored with four awards from the National Association of Builder’s 50+ Housing Awards Competition, including: the Gold Award for 50+ Detached Home Over 2,100 Square Feet, the Gold Award for Best 50+ Lifestyle Sales Center, the Silver Award for 50+ Sale Community Over 200 homes, and the Silver Award for 50+ Detached Home Up to 2,100 Square Feet. Within Solivita’s gates, residents can enjoy an exciting line-up of amenities spread across multiple facilities, including the Riviera Spa & Fitness Center, the Palms Amenity Complex, the Waterfront Galleries and the Starlite Ballroom. These beautifully appointed amenity centers provide state-of-the-art fitness centers, indoor and outdoor swimming pools, hobby and game rooms, and much more. The Waterfront Galleries offers an ideal space for creative self-expression and the Starlite Ballroom plays host to numerous community events. Taking full advantage of the sunny Florida climate, Solivita’s lush grounds are filled with outdoor recreations for both friendly competition and relaxed socializing. Residents can gather at the Palms Amenity Complex’s wraparound covered terrace, spacious sundeck or cozy fireplace piazza. Pavilions outside the Waterfront Galleries are ideal for both private and community events. The ground’s multiple sports facilities include lighted Har-Tru tennis courts and pickleball courts, bocce ball courts, horseshoe pits and a championship-caliber softball diamond. 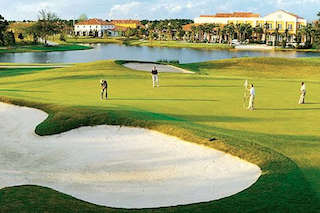 The semi-private Stonegate Golf Club at Solivita includes two championship 18-hole golf courses. Resident golfers enjoy challenging play with an optional membership at the semi-private Stonegate Golf Club. This impressive complex features two 18-hole championship golf courses, a casual bar and restaurant, men’s and women’s locker rooms, and a golf pro shop. Practice facilities include chipping and putting greens, as well as an aquatic driving range. Yet the golf course is not the only place residents will see golf carts. Solivita has been designed to accommodate golf cart access and many residents use their carts as primary transportation throughout the community. Many new home designs also include expanded garages for golf cart storage. When it comes to homes, today’s buyers can choose from available resale and new construction designs in both single-family and attached home styles. Resale homes were built in a wide variety of floor plans sized from about 1,000 to over 3,000 square feet. Most feature two bedrooms, two bathrooms and a two-car garage, although larger homes may have up to four bedrooms, additional bathrooms and three-car garages. New construction homes are now available in 16 exciting new floor plans, including 12 which can be toured as model homes. These new designs range from 1,359 to 3,052 square feet and are designed with an eye toward entertaining and outdoor living. Many models feature large lanais, private courtyards and even backyard swimming pools. Additional highlights of the new home collections include space for house guests or roommates. Floor plans like the 1,978 square-foot Panhandle model are designed with two luxurious master bedroom suites, while the 2,292 square-foot Jacksonville model also adds a third guest suite. The largest floor plan, the 3,057 square-foot Miami model, has one master bedroom suite, a second bedroom suite, and a guest apartment with its own kitchen and full bathroom. Designed to support a modern active adult lifestyle, Solivita offers true resort-style living in the heart of Central Florida.